Picked a packet of these up at a baby show this weekend and they’re great. Mine came with a safety barrier too to stop baby putting too far down their throat. I’m so impressed. He hasn’t yet got any teeth but I’ve given it to him to chew to get used to and he loves it. My little boy loves his first toothbrush! It's easy for him to hold and use he also uses his as a teether and it works for him. Gave this toothbrush to my daughter at the age of 8 months, even before her teeth came through, and she enjoyed chewing on it, now she has some teeth its very easy for her to hold and be direct to scrub by me. The tooth brush is a great size for both myself and little one to hold, little one loved ot while teething as it was nice n soft to chew on, now teeth are starting to show i think the head is soft enough to feel nice on the teeth/gums.. we are very happy with the mam tooth brush. Such a good product; my little girl loved hers. It was nice that she was able to try and brush her teeth herself. Obviously Mummy brushed them first! Lovely bright colours and very reasonably priced! This was my little ones first tooth brush. 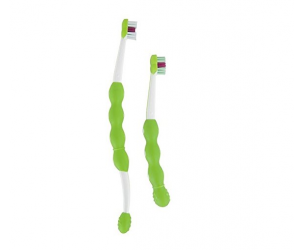 It is perfect for those little gums especially when they are teething. Very easy for the little hands to grip,chew and explore. My girl loved it so much that she fussed about when we were planning on getting her a new one. Absolutely recommended for first tooth brush! This toothbrush is great for my 1 year old he plays and holds it and chews on it and also cleans his teeth. Very easy to clean and we take it on days out. The MAM Training Brush and First Brush are designed with ergonomic handles for easy holding and brushing. In two steps babies learn correct and independent tooth brushing. First step: Training Brush The extra long handle allows parents and babies to hold the brush together, to learn the correct brushing motions. 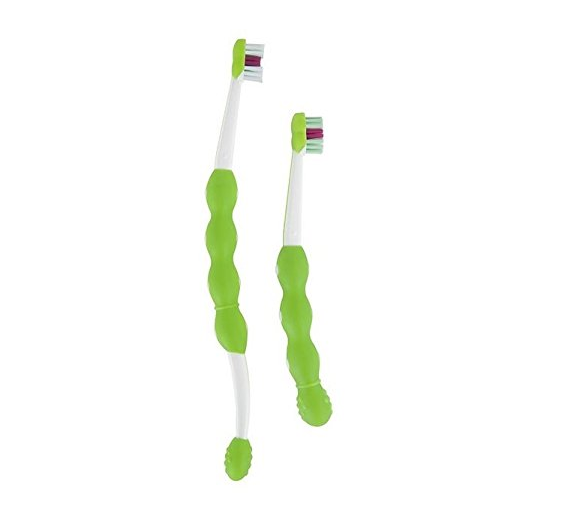 Second step: First Toothbrush Babies can imitate adults by brushing independently.